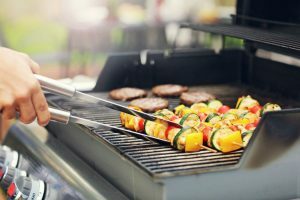 If you are looking for a compact and non-polluting grill for your apartment balcony or patio, then the Char-Broil TRU-Infrared Electric Grill is a great choice. This product is designed perfectly for smaller spaces. Even though the equipment has a compact design, this electric grill has an impressive grill area for cooking food for a small group of people. This electric grill can be used for outdoor cooking purpose with ease. You will be able to make your outdoor parties more interesting with this grill. As this product from Char-Broil is equipped with wheels, it is easy to move around and hence can be used on location away from home provided you have the power supply. The main advantage of this infrared heated grill is that it retains the flavor of the food as it heats up the food directly. 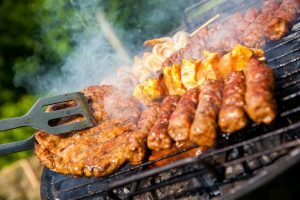 Your grilled food will be juicier when compared to the food cooked in other types of grills. 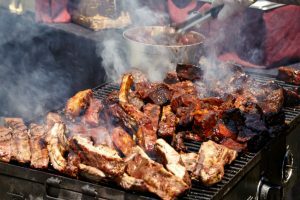 You don’t have to worry about the hot and cold spots in your grilled product. 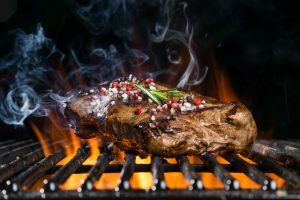 The high heat provided by the grill help with cooking meat items easily. 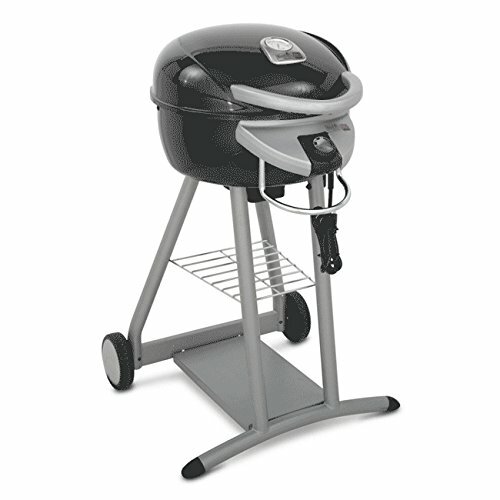 There are different accessories available for this product to make grilling on patio easier. 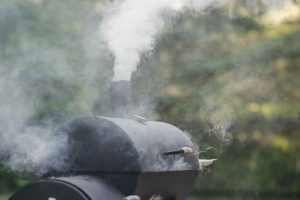 Though the Char-Broil TRU Infra-Red Electric Grill has minor inconvenience, it is the best grill available for grilling foods for 10 to 12 people easily. This is the ideal product for residents of apartments and condos. You will be able to cook meat and vegetables to perfection when you have this grill with infrared heating. This is the small footprint grill for small space. You can get the perfect seat marking on the grilled food with this product. You don’t have to worry about getting charcoal or refilling propane when you have this easy to handle the product. The porcelain coating makes cleaning and maintaining the product a breeze. You don’t have to worry about flare-ups hitting your face as the infrared heating prevents flare-ups. So, this is a safer option for the novice interested in grilling. You will be able to cook different varieties of food items like hot dogs, pizzas, pork, beef, poultry and many veggies according to your need. The faster heating up reduces the time needed for cooking and you will be able to control the temperature in a perfect way using the thermometer on the lid and the temperature control knob. As it can be used indoors, you will be able to enjoy grilled food all through the year. 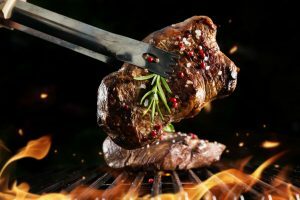 When compared with similar models like George Foreman GFO201RX Indoor/Outdoor Electric Grill or Weber 55020001 Q 2400 Electric Grill, the Char-Broil Patio Bistro Electric Grill delivers true value for the money. The heating power and grilling surface available for the two products are lower than that of the Char-Broil model. Moreover, the other two products will not be able to provide the perfect grill flavor as the infrared heated char broil product will do. 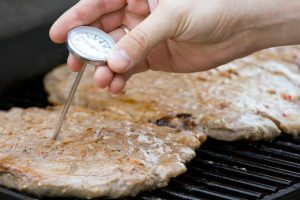 The temperature gauge in Char-Broil allows perfect temperature management and consistency in grilling the food. Though char broil is a bit expensive than the George Foreman it offers a better feature also. The Weber model is highly expensive and you can get almost all the features in char broil at a much-reduced price. 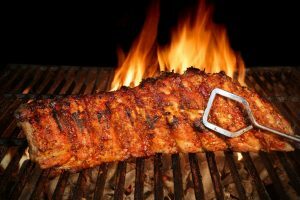 The only advantage of buying Weber is that it comes fully assembled and the user does not have to spend time to assemble the product. 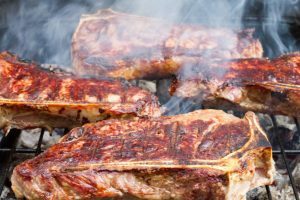 However, you will need less than 30 minutes to assemble the char broil product and if you are looking for an affordable electric grill with moderately good features, then the Char-Broil TRU Infra Red Patio Bistro Electric Grill can be the best pick. You can make grilling for small gatherings rather easy and enjoyable with Char-Broil TRU Infra Red Patio Bistro Electric Grill. This is a product with smart design and durable material and is very convenient to use even in congested balconies and patios. The infrared grill directs the heat close to food and offers perfect and faster cooking. It is perfect for areas where you cannot opt for open flame cooking. The ample primary cooking surface and additional warming rack makes cooking and storing food easier for the user. The parts of these products are available for replacement; hence there is no need for replacing the whole unit if something goes wrong. With a wide range of food items that can be cooked using this product and the ability to use them indoors throughout the year gives complete value for money spent on this product. You can easily find this at an affordable price, from well-known shopping sites in the country. You can use them easily with a 120V power outlet. The cord of the product may be a bit smaller but you can use the extension cords to overcome this problem. You will be able to use the product for years as the combination of ceramic and steel offers sturdiness and durability. You will find this product very helpful for your home cooking needs as well as for conducting small parties. It will be a great value addition to your kitchen.